Learning bird sounds is probably the single most important skill in moving from beginning birding to intermediate birding. And from that point onward, using sounds to your advantage is an essential tool and an endless source of learning, discovery, and enjoyment. Fortunately, we live in a time when excellent digital recording archives coexist with tiny, powerful computers. You can actually carry a shelf full of field guides, a library full of recordings, and a pretty decent camera around in your pocket, with room left over for your car keys. Bear in mind that the new bird song apps won’t change one aspect of learning: it is still going to take lots of practice. But some apps make it much easier to get that practice in—by organizing similar songs into useful groups, by coaching you with expert advice as you listen, and by turning practice sessions into fun quizzes. Some apps focus specifically on learning sounds; some provide a comprehensive collection of sounds but little instruction; and some reproduce complete field guides, adding songs but not focusing on them. Which type is right for you? It depends on your objective. If you want to practice and improve your sound identification skills, it’s well worth the extra price to choose one of the dedicated learning apps. However, if you’re just looking for an overall reference that allows you to check on bird songs one species at a time, you may find that a single field guide app is enough. Our review addresses the learning apps in detail first; then we’ll go over some of the features of the sound collection/field guide apps to help you tell them apart. Whichever app you choose, please remember to use the recordings responsibly—one good reference for this is birder and field guide author David Sibley’s guidelines about how to use playback. 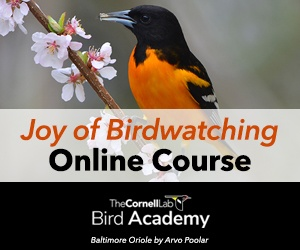 Ease of use: We’re talking about an advanced skill involving hours of practice, and a list that may include 700+ bird species, multiple songs and calls, and geographic variation. Every app has to deal with the basic problem of how to organize itself—and they all do it differently. We’ll tell you which ones worked for us. Audio content: How many songs, calls, and types of regional variation does the app offer? In other words, are you learning what a species sounds like, or what a single recording sounds like? Expert help: Songs are complicated. One thing we looked for is that element of an expert who can help guide you toward what to listen for. Fun factor: There’s no way around it: learning songs takes practice. An app needs to be fun to get you to put in enough time to make progress. Ease of use: Larkwire tackles the inherent complexities of sound apps in two smart ways. First, they pepper you with tips while you’re playing so that you gradually learn how the app is set up. We found this easier than having to digest a long intro screen that we may never see again. Second, and more importantly, they have put a ton of work into organizing birds into similar-sounding groups that you can easily select from the get-go, instead of having to laboriously assemble your own playlists. Audio content: Far and away the best and most comprehensive of any of the learning apps. Multiple songs and regional variations added as you increase your level of difficulty, ensuring that you learn the song pattern. The app is kept manageable by restricting it to either landbirds or waterbirds—each app gives you depth rather than breadth. Expert help: Excellent text by birding superhero Michael O’Brien remains visible while you are studying or taking the quiz. The text offers specific pointers about how each sound differs from other, similar-sounding birds. Fun factor: In the quiz module, you rack up cute bird silhouettes as you get answers right, or you watch them get replaced with a red bird’s foot if you get one wrong. The suspense can be thrilling, but the game does not naturally end, which can make you feel worn out. Bottom line: With its combination of great sound diversity, expert help, and well-organized groups of species, this is a uniformly excellent sound-learning app that will prove useful to starters and experts alike. Ease of use: The option to sort roughly by bird “commonness” is a nice touch for users who want to learn the basics first. Songs can also be sorted into a handful of categories based on the types of sounds. Slideshow mode lets you sit back and watch/listen to birds slide across the screen, though some users wanted to be able to choose the speed and/or go back. Audio content: Includes some 240 species, but just one or two sounds per species means you may focus more on the sound of an individual recording than on the overall sound of the bird. Expert help: In review mode you can listen to songs and read a helpful text description of the sound. The text describes the sound and sometimes gives mnemonics, but few specific comparisons to similar species. Fun factor: This app had the most fun game experience of any app we tested. You race the clock to identify songs; you get three lives; and you score more for quicker responses. The game ends before you get tired of it, and there’s even a High Score list where you get to enter your name. Some of us didn’t want to stop playing. Bottom line: This well-designed app features an addictive gaming style that will go a long way toward getting you to put in the necessary hours to learn your songs. The number of songs per species is limited and it can be hard to zero in on just the right set of bird songs to learn, but this is still a well-designed app with emphasis on fun. Ease of use: A slide-out sidebar menu keeps the app’s many options close at hand, and is easier then memorizing what icons mean. However, it can be hard to assemble specific songs into a playlist. There are no predetermined sets of similar songs (update: see comment below from Larry Underwood describing how to access similar songs), and the filter-by-region or -season function often has surprise inclusions or omissions. Audio content: Typically includes one song example per species, and offers call notes for some of the common species. Expert help: The app contains basic occurrence information for each species, but unfortunately offers no advice on the songs themselves. Fun factor: We loved the way this game plays the song for a few seconds before showing you multiple choice answers. All other games show you the choices from the start, which partially distracts you from the sound itself. You also have the option to get a hint about the song—the hint is a photo of the bird, which may be too much of a hint for a lot of birders but does offer a way to check your guesses. The game does not seem to progress toward an endpoint, meaning you miss out on a sense of completion or achievement. The game does offer summary statistics so you can check on your progress. Bottom line: This is a very customizable app, although users may find it tedious to assemble their own lists of target species. We wished that it had more sound-specific text to augment the sounds themselves. We liked the clever choice to play songs for a few seconds before showing you any multiple choice answers—a feature that many users will find helpful for learning. Sound-focused app with very extensive sounds including geographical variation and, often, chip notes. A Favorites list lets you make a shortlist of species. One photo per species; this is not a field guide app. Also available are BirdTunes Basic that includes 135 species for $1.99, and BirdTunes Lite that is free and includes 24 common bird species. Sound-focused app that organizes the sounds from the Stokes field guide series. Additional Birdjam apps include a warbler-specific and a sparrow-specific app, $4.99 each. Field guide app; focus on visual ID but sound resources are also strong, featuring songs as well as chip notes and geographical variation. Text describing similar-sounding species—with the similar species playable from the same screen—helps you explore possibilities when trying to ID a sound. A lite version featuring 70+ species is free. Field guide app with focus on visual ID, featuring extensive, detailed images from the extremely popular print field guide. An extensive set of sounds includes song and call examples with good text descriptions. Similar-sounding species can be hard to navigate to. There is also a free version of the app that contains 30 species. Field guide app with focus on visual ID. A very popular app with extensive species coverage (including Hawaiian birds). Features multiple sound examples per species and a helpful list of similar species playable from the same page, but minimal text about the sounds. Also features sound spectrograms, which can be very helpful for studying sound details, although size is a bit small on the iPhone. Also available, a backyard version covering 231 species, $2.99. Field guide app with focus on visual ID. Options to search for species by region, month, and abundance; songs can be hard to search. Integration with NatureShare social network is highlighted throughout app. Option to look for nearby birds using eBird. Audubon also has a host of other apps covering geographic regions and other insects, wildlife, and plants: free to $19.99. Field guide app with focus on visual ID. App features complex navigation via icons and swipes that can be time-saving once learned. Sounds include one recording per species, playable directly from the field guide image. A “pocket edition” has fewer features (though it keeps the sounds and maps); it still covers 820 species and is only $1.99; a backyard version is free and covers 160 species. These innovative apps help you get the most from eBird while in the field. This app focuses on bird-finding, but also includes brief ID text, photos, and sounds. It queries the eBird database to find notable recent sightings or target birds near you. You can view other people’s eBird checklists and get driving directions to birds or places of interest—very useful when exploring away from home. Also available in various continent/country/region-specific versions, $1.99 to $19.99. This app does not contain sounds. It allows you to enter sightings into eBird from your phone. Although many field guide apps feature self-contained life lists, this app updates your eBird account, which is then accessible from any web browser. 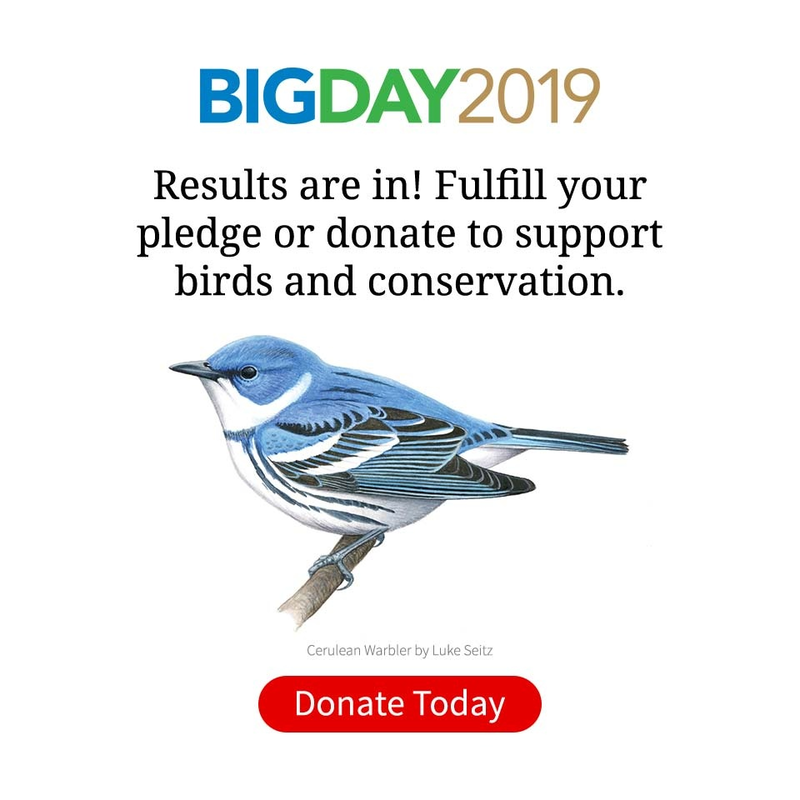 Your data also help build the overall eBird database used by scientists. Also available in worldwide and country-specific versions, $9.99 to $19.99. Our new app focuses on ID but also includes some sounds. Merlin asks you a few simple questions about the bird you observe and then reveals a list of birds near you that best match your description. Merlin covers 285 of the most common bird species in the U.S. and Canada (excluding Hawaii) and includes more than 100 photos and sounds from the Cornell Lab’s Macaulay Library. Powered by eBird to deliver the most accurate results based on millions of sightings from bird watchers across North America, Merlin also gives you ID tips from Cornell Lab of Ornithology experts. You can also buy curated collections of North American birds, all ready to load into your music player: the Master Set, with nearly 5,000 tracks, and the Essential Set, with about 1,300. 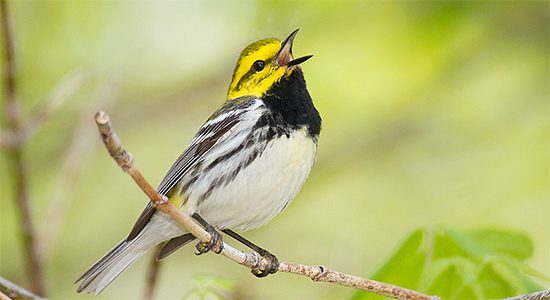 Finally, if you buy the groundbreaking new Warbler Guide (see our review) and you want to learn warbler sounds, you’ll want to buy the guide’s sound supplement, also from our Macaulay Library, for just $5.99. Finally, what about uploading a recording and having a computer tell you what bird made the sound? In 2014, that’s still a very tall order for a computer, but several projects are working on it. In the Jan/Feb 2014 issue of Birding magazine, Diana Doyle addresses the state of the art in What’s That Bird Song? Ask the Gizmo! [PDF, used with permission].